Introduction: Morbidity and mortality due to tuberculosis are rising steadily. Despite having efficient drugs and treatment protocols, microbial drug resistance often leads to treatment failure. Efforts to bring novel drugs to combat this menace are hampered by several issues including problems in gaining industry support, motivation and ethical issues clinical trials. Bedaquiline and Delaminid are the only novel drugs approved in the last three decades for treating TB. A few more molecules and drug combinations are still in clinical trials. One such drug is the BM212, a potent anti-TB agent which acts by a novel mechanism of action. 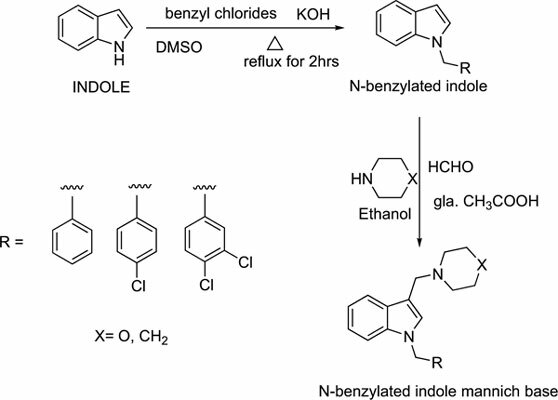 Methods: In the present study, we used virtual screening method with a combination of molecular hybridization technique to design N-benzylated Indole Mannich bases as potent anti-TB agent based on BM212 pharmacophore. The library of designed molecules was prepared and screened using BM212 model. The top 5 ‘hit’ molecules were selected (with good TC score >1.15), synthesized and screened for anti TB activity by MABA assay method. Results and Conclusion: All the compounds showed excellent anti TB activity, of which 4 compounds have shown MIC ≤12.5 µg/mL. Our protocol could help in the designing of newer anti-TB agents with better bioactivity profile. Molecular hybridization, virtual screening, mannich bases, MABA, morbidity, mortality.